• Not For Use With Powerful Chewers. 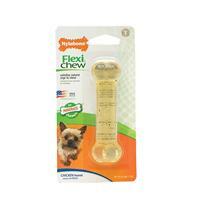 • Be Sure To Select The Right Chew and Size For Your Dog S Particular Chewing Style. • Bristles Raised During Chewing Will Help To Clean The Teeth, and This Cleaning Action Will Help Control Plaque and Tartar Buildup. Inert soft thermoplastic polymer chicken meal. Not consumable. Only small shavings no larger than a grain of rice can pass through safely. Replace when knuckles on ends have been worn down. Non toxic. Size: petite. Nylabone - Gumabone Chicken Bone - Petite product is categorised under Wholesale Nylabone Products, PA products, Wholesale Dog Products, Wholesale Toys, Wholesale Chew Toys.